Clay Wallace, a 2007 staff member with Capital Sound, submitted this photo and caption. 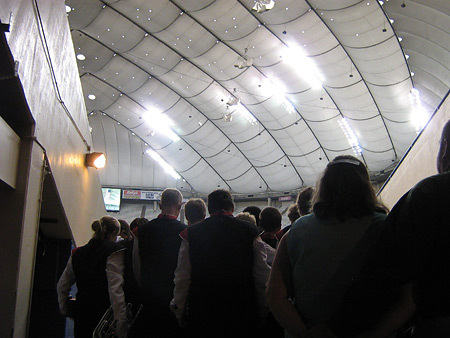 This photo is of Capital Sound during our last pre-show huddle in the tunnel of the RCA Dome in Indianapolis last summer. My wife, a staff member for Pioneer, bowed out of some of Pioneer's pre-show warm up in order to get photos of our final performance. Thanks Kim, for an inspiring shot, and thank you Pioneer for allowing her to get it.